Please note that this driver requires a 32-bit version of Windows Vista. It cannot be used with other versions of Windows. This driver is not intended for RoMI/O II. First download and unzip the driver file. 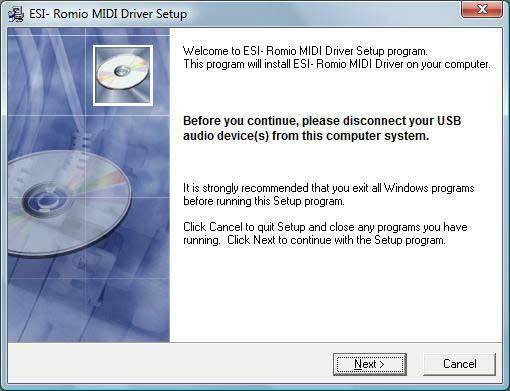 Make sure that RoMI/O is not connected to your computer before you install the driver. Then launch setup.exe from the unzipped folder. When launching the installation, Windows Vista might prompt a security message. Make sure to allow the installation. You will then see a dialog as shown on the following picture. Click Next. You can define the target directory for the installation in the following dialog. Confirm it with Next. 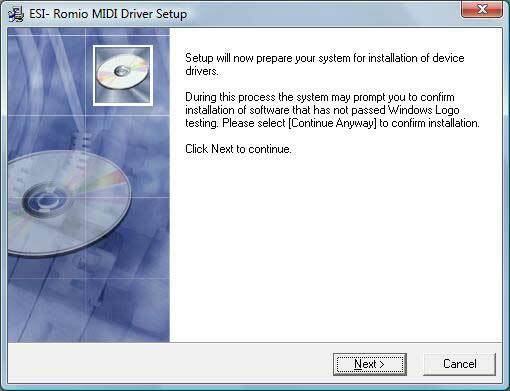 The installer now informs you that the driver installation will start as shown below. Confirm any such dialog with Install. You will then be prompted to connect the hardware in the dialog shown below. Plug in RoMI/O but do not click Next yet. 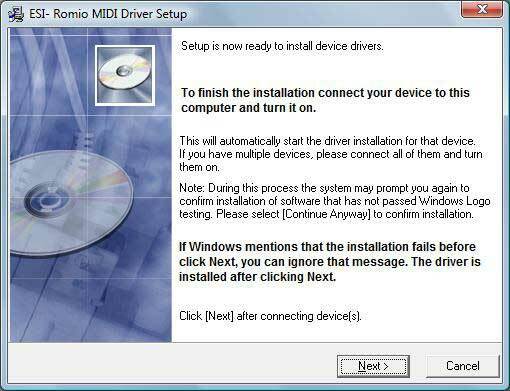 Instead, wait a few seconds for the automatic device driver installation. You can monitor this in the task notification area where Windows Vista informs that the driver is installed via a bubble message box. Please note that in some cases it is possible that Windows Vista will show an error message that says the installation could not be completed. If that happens, just ignore the message. This is not important as the actual driver installation is finalized by the installer later. 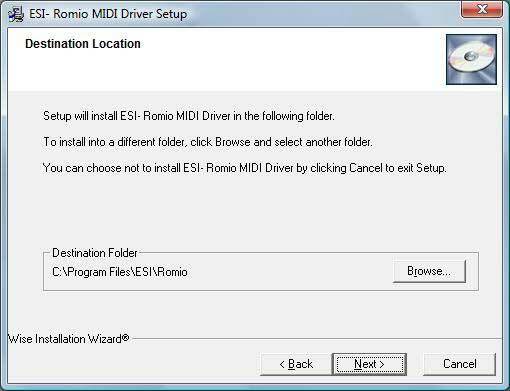 Once Windows shows no further messages, you can finish the installation by clicking Next in the Romio MIDI Driver Setup dialog shown above. The installation will be finalized now and after that you can start using RoMI/O in your applications.